"Temple of Sound and Light"
Acrylics, Aerosol, marker on custom triangle canvas. Started at Fractalfest 2016. The temple is inspired by stage builds, lighting designs and concert production at music festivals all over the world. This piece pays homage to the ancient ritual of human beings gathering for ecstatic dance over rhythmic beats, around some type of sacred altar, edifice or diety, during holy days or periods of celebration. "Temple of Sound and Light" represents the stage of the future, where the DJ / head vibe controller, levitates in a glowing chamber, using mind waves and meditation to alter the frequencies emitting from the temple. He/she is in tune with the atmosphere surrounding the temple, and harnesses the organic energy sources of water and earth to power the booming soundsystem. A path of fire leads up the temple steps, inviting the viewer to pursue higher states of being, through trials and tribulations. Bright colorful bursts of light radiate from the core of the temple, creating a dazzling light show that attracts attention from all directions. Mostly notably, the Beacon erupting in flames from the temple's peak, signals to a flying saucer, an extraterrestrial being which has made contact to the powerful frequency channeled below. Or another possibility, the spaceship has launched from the temple below, the collective force has accelerated this new technology into orbit. Either way, the presence of a higher source above the heavens is known, which the temple pilot aspires to reach. Though this temple possesses a very futuristic sound and lighting system, it's roots are very old and rich in tradition and mystery. Built on rubble, stone, and earthy jungle, the foundation dates back thousands of years. Waterfalls flow through cracks and vegetation covers much of the surface. There is a harmony of elements, as lava flows down the steps, and cloud vapor disperses above the temples lights. The pure plasma energy, which glows bright green, illuminates much of the scene, and synchronizes with the stars amongst background sky. Through the unification of sound, light, earth, water, fire, air, energy, and space, an alchemical miracle has emerged: a vessel which can allow the being to experience interdimensional travel. This formula, though seemingly novel in nature, derives from the shamanic wisdom of cultures who have passed long ago. We now bear the torch, to continue spreading this knowledge through engaging in tribal dance rituals, temple building, psychedelic plant sacraments, and creative expression, as a catalyst for the healing, liberation, and evolution of our species. 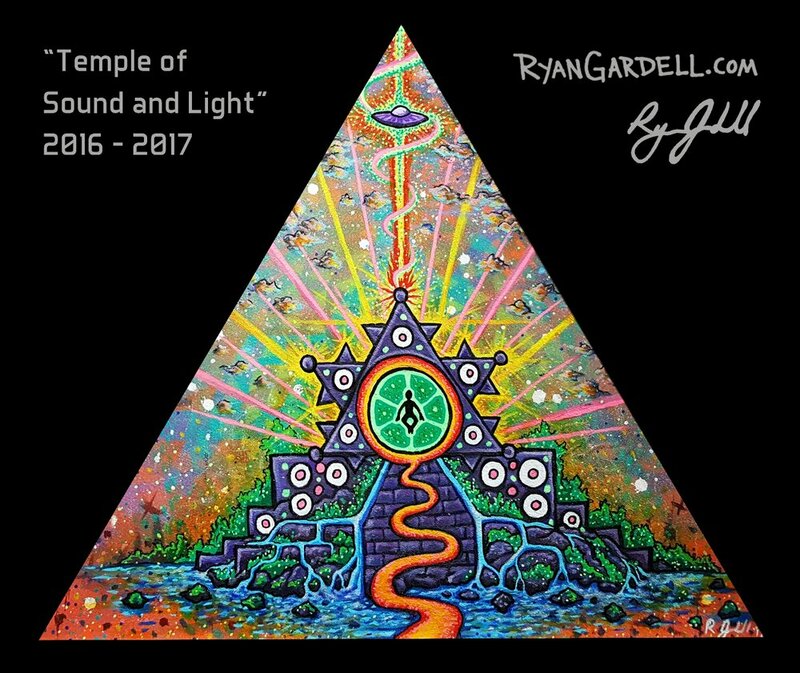 Prints, stickers and other forms of "Temple of Sound and Light" will be available soon.